The sacked Managing Directors of five banks affected by the new reforms by the Central Bank of Nigeria (CBN), their executive directors and managing directors of some of their subsidiaries who have been in detention will be arraigned in a federal high court between tomorrow and Wednesday. According to officials of the Economic and Financial Crimes Commission (EFCC), charges would be filed in court against the bank chiefs tomorrow while they may be arrai-gned between Monday and Wednesday. The bank chiefs to be arraigned include Mrs. Cecilia Ibru of Oceanic Bank International, Berth Ebong of Union Bank, Sebastian Adigwe of Afribank and Okey Nwosu of Finbank. The fifth managing director, Erastus Akingbola of Intercontinental Bank has been declared wanted by the anti-graft agency which has vowed to use the Interpol to extradite him. Mrs. Ibru will be facing charges of money laundering and about 120 other offences which the EFCC said contributed to the illiquidity and other problems faced by the bank. She is being accused of using a company, Waves Project Nigeria Limited owned initially by her children and later handed over to her former domestic aide to launder N15 billion which was taken out of the bank coffer under suspicious circumstances and transferred abroad. THISDAY gathered that among the charges that may be preferred against Mrs Ibru and others are insider trading, fraudulent abuse of process of award of facilities and fraudulent manipulation of capital market. Details on Ibru's controversial transactions through the Waves Project Nigeria Limited available to THISDAY showed that as at 2006, the company was co-owned by Obaro and Bivi A.O Ibru and one Simpson Okoro. By 2007, the Ibrus relinquished their ownership to Nana Bedell and Dele Oye. Nana's real name is Nana Bedell while her marital name is Abdulahi. 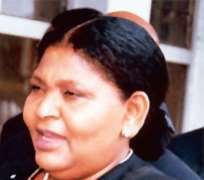 However, to facilitate the movement of cash through facilities from Oceanic Bank, Ibru, THISDAY learnt, allegedly opened five different files for Nana, her former domestic aide with five different names. According to THISDAY investigations, Ibru had opened the files with such names as- Nana Abdulahi, Nana Shetu Bedell, Nana Shetu Priscilia Bedell, Priscilia N. Abdulai and Nana Udenwa. With these names, Ibru was alleged to have taken out money to the tune of N15 billion on the pretext of facilities extended to the company owned by the various names. The loans have been found by the CBN examiners to be non-performing. At one point, Ibru, it was alleged withdrew cash of N47 million from the bank coffer and made cash payment of N247 million into Nana's account. Another withdrawal of N78 million was also recorded as being made from the same account. EFCC, THISDAY gathered will formally file the preferred charges on Monday while the detained back chiefs would be arraigned on Tuesday. Also, the 226 individual bank customers whose names were included in the list of debtors to the five banks affected by the on-going reforms initiated by the Central Bank of Nigeria (CBN) have been put on a watch-list by security agencies at all airports and border posts. The anti-graft commission working with other security agencies at the nation's international airports and land border posts have also been instructed to ensure that none of the 226 debtors whose names were published by the CBN as owing Oceanic, Afribank, Finbank, Intercon-tinental and Union Bank various loans which were found to be non-performing by CBN examiners travel out of the country. The bank debtors are said to be under restriction from leaving the country until they settle the loans and get clearance from the EFCC. THISDAY gathered that a few of the debtors who were not aware of the directive had been turned back at the Murtala Muhammed International Airport, Lagos while trying to travel out of the country.